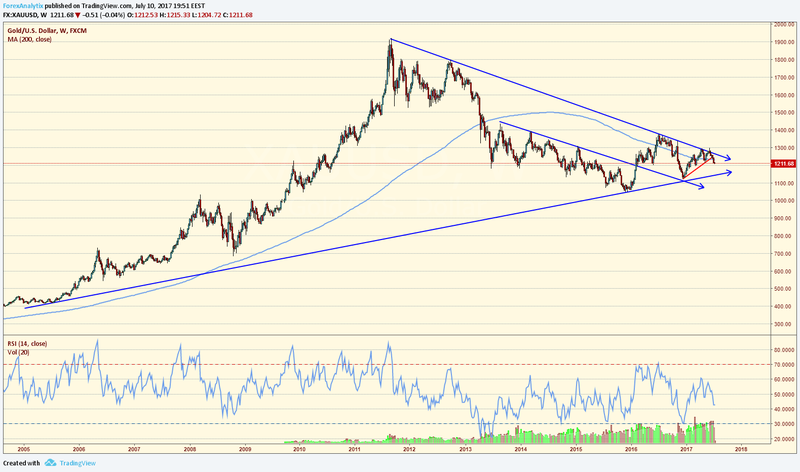 Are precious metals breaking down, or are we setting up for a big rally? Gold and Silver are assets which have been of great importance for thousands of years. Up until a few decades ago, gold was explicitly linked to currencies (such as the US$) and was broadly used as money. In the past few decades – particularly following Nixon’s decoupling of the gold/dollar convertibility – precious metals have been greatly criticized by leading academics and investors alike. Warren Buffet famously called gold a “barbarous relic”, but is he right? Gold’s scarcity and physical characteristics (longevity, divisibility etc) allowed it to become the main form of money for centuries. However, technology advances and continuing financial innovation have taken away a big part of its appeal. Silver’s monetary role always played second fiddle to gold, but it compensates by having extensive industrial use. Precious metals have been historically correlated with long-term real interest rates (interest rate minus inflation) and this is quite a consistent indicator for short-term performance. However we must note that this is not always the case, for example the 1980s-1990s bear market happened while real rates were at historically low levels. In today’s markets, following a major 10-year rally in global bonds, yields are now starting to rise and that has brought downward pressure to metals. 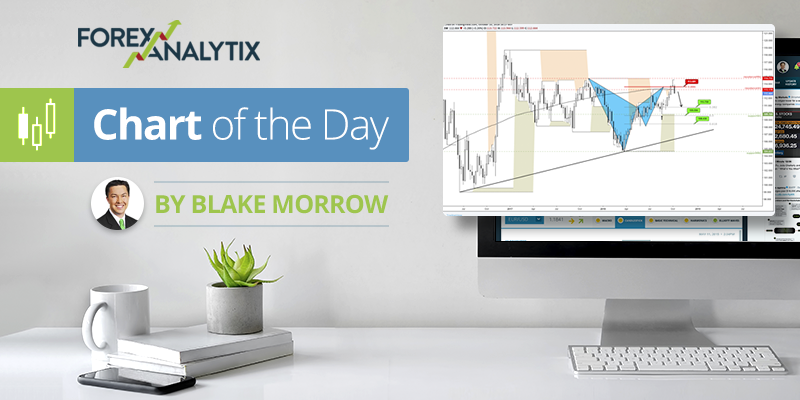 PMs are priced in US Dollars so naturally the Dollar itself is another important price driver. Bulls are especially concerned about recent price action in this respect. The DXY index has fallen over 5% during the past 2-3 months but Gold has also dropped 5%. Furthermore, silver has crashed nearly 20% lower during that same time period! In light of this, PM bulls must surely wonder how much lower they will go once the Dollar finally starts to bounce. Another price driver that has surfaced in the recent 2-3 years are crypto-currencies. Cryptos have been specifically designed to mimic some of the positive characteristics of precious metals, without their drawbacks. Like gold & silver, they are also “mined” with progressive difficulty. They seem to solve the inflation problem by having a finite supply by design, although critics refute this argument by pointing out that there are hundreds of different crypto-currencies and hence supply is theoretically infinite. The 10 most popular crypto-currencies currently have a combined market capitalization of just under $80 billion, so they are definitely a factor to watch closely. Finally, precious metals (particularly Gold) are hoarded and used simply as a store of value. The vast majority of the world’s physical gold is kept unused within vaults or safes. As the purchasing power of most major fiat currencies falls, individuals increase their demand levels for physical metals. 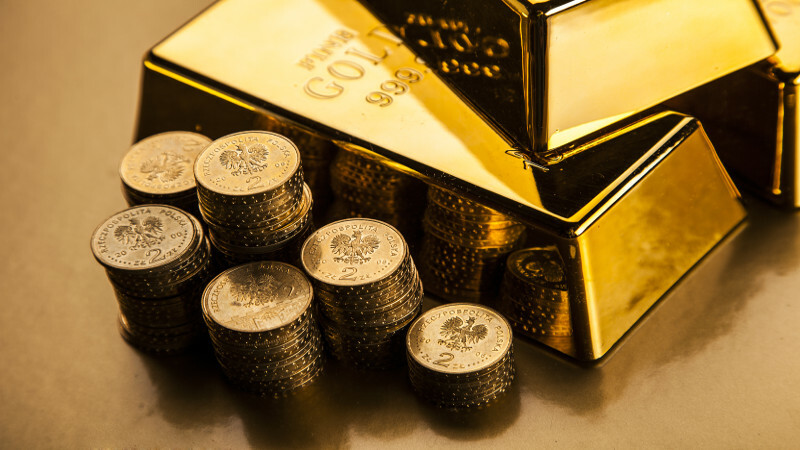 Having said that, central banks also often get involved in the physical gold market and produce significant price moves (the most famous example is probably Gordon Grown selling UK gold between 1999 and 2002, at $250-$300 just before gold’s biggest bull run to date). 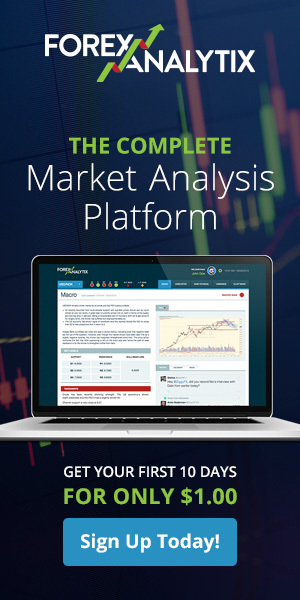 All the above analysis is based on efficient markets that operate with normal supply & demand characteristics. It may sound controversial, but it can be argued that gold & silver markets no longer meet that requirement. They are sell orders in the leveraged futures market (i.e. paper, non-physical). They are of large size. They are executed during an illiquid time of day (usually outside European and US trading hours). They are executed with no apparent desire for best execution; they are done in one go, taking out many levels below current price. They seem to have only one goal: to lower the asset price as much as possible, as quickly as possible. They are often attributed to “fat finger” trades. The most recent such example is the two June/July silver flash-crashes. They occurred 9 trading days apart, had all the above characteristics and their immediate damage to silver price was 6% and 10% respectively. Such dramatic and inexplicable price moves shake peoples’ confidence in these markets and can cause big shifts in positioning & sentiment. From a macro perspective, making meaningful conclusions on Gold & Silver is a difficult task. 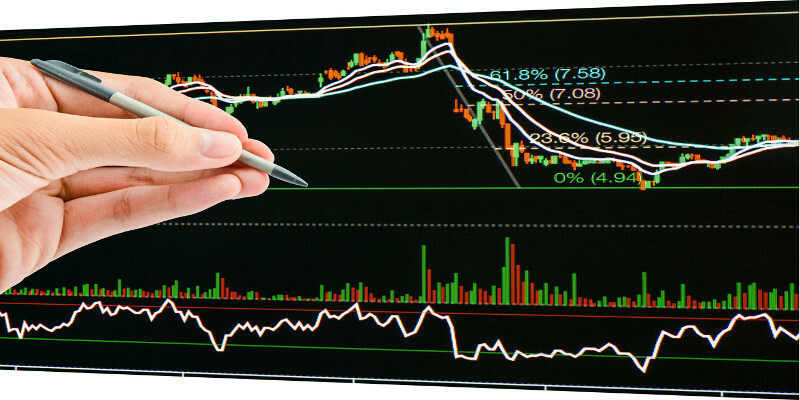 We can identify several important economic drivers that can be used to meaningfully explain price action. However, all these pale in insignificance when the markets experience the dramatic price moves described above. It’s important for investors to be fully aware of these when deciding entry & exit points and – most importantly – size and leverage. It’s hard not to notice the selling pressure gold and silver have been under the last few weeks, but in order to get a good picture of what is happening, you have to take a step back and look at the last 10+ years of price action. 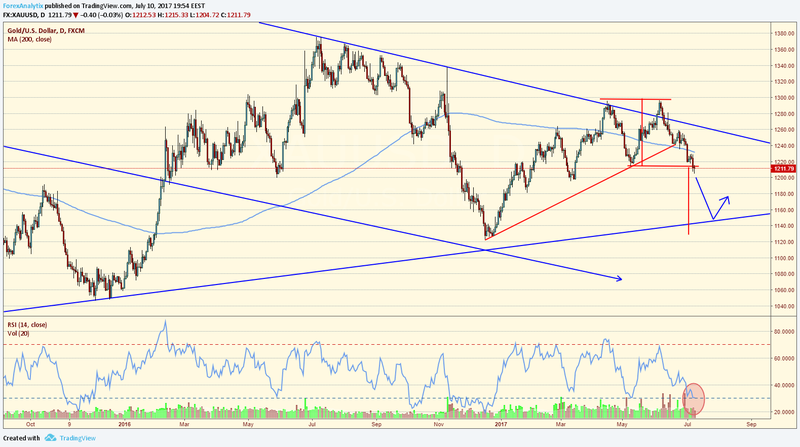 Gold’s longer term view shows a very large triangle pattern which could allow for a strong bounce as we approach $1150. See below. The false breakout of the triangle. Both of those events should allow for some near term weakness, however that possible breakdown towards $1150 may stop short of completing the double top as we hit longer term trend line support. If I was a bull, I would be looking there ($1150) for a good risk/reward long. Silver spent 15 months building a base at around $14, from December 2014 since February 2016. That period was followed by a rebound that took silver above $21 exactly a year ago and since then the metal has been steadily depreciating with last week’s flash crash bringing it back to retest the same zone once again. As long as the $16 level caps the price action silver is in danger of dripping back to $14 while a break below that level would bring it to 8 year lows. 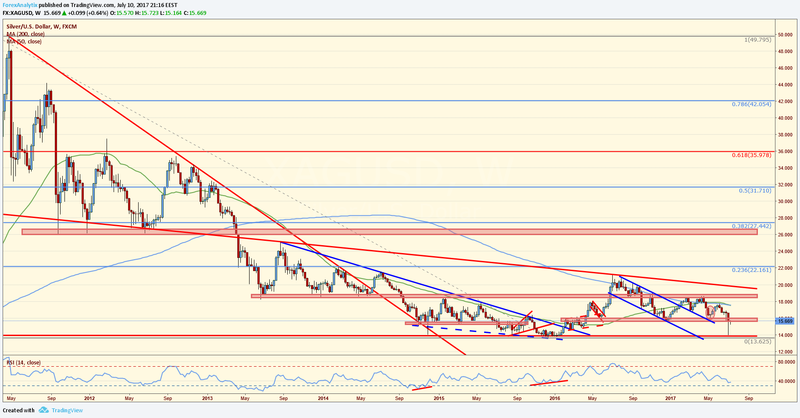 A weekly close above $16 is required to relief the pressure but even then $18.50 is the level that has to be breached for silver to regain its shine and become bullish. There is only 1 thing at the moment that gives hope to gold and silver bulls and that is the extreme readings of DSI (daily sentiment index) and the COT’s that show that investors are extremely bearish the metals both from a positioning and a sentiment standpoint. These are usually great contrarian indicators. To summarize, the risks are significant and unless we see a strong reversal and a change of behavior we cannot turn bullish. Gold has retraced to 50% of the rally from the December 2016 lows, something it failed to reach in the early May decline. 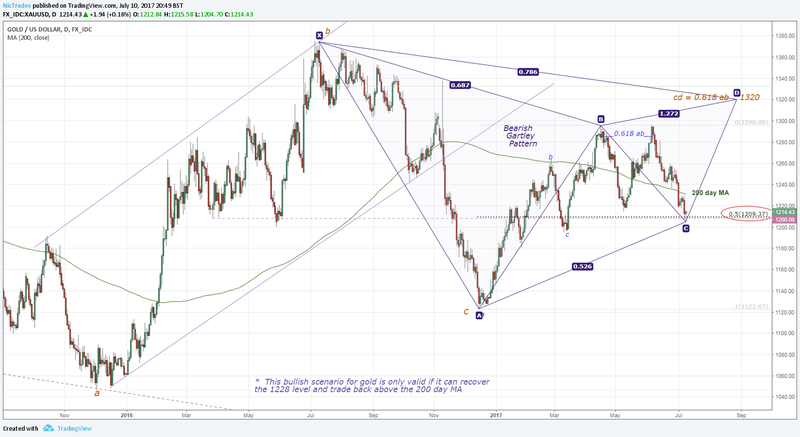 If Gold can recover the 1228 level and trade back above the 200 day MA then the rally from December 2016 to April 2017 may just have been the first leg in a bigger ABCD pattern and I see a bearish Gartley pattern at 1320 which is also where the rally would be 0.618 of the length of the December-April rally. 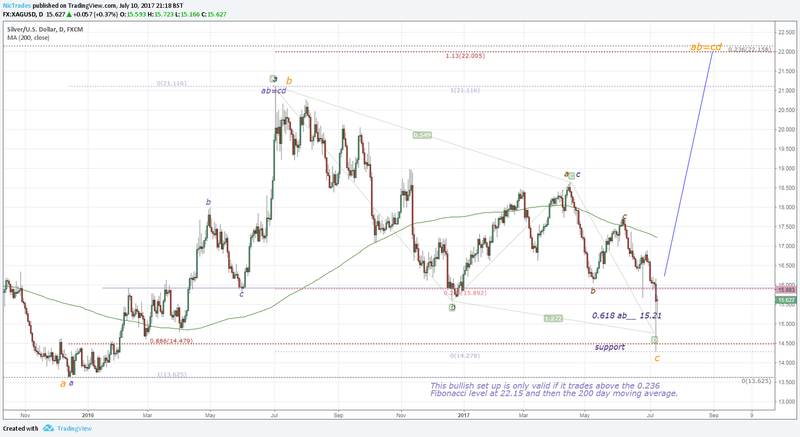 The 0.236 Fibonacci retrace level from the 2011 highs in silver is at 22.158. It was unusual that we did not reach it in the rally from the December 2016 lows. It sets up a second leg of an ABCD pattern (or EW ABC) correction to this level. 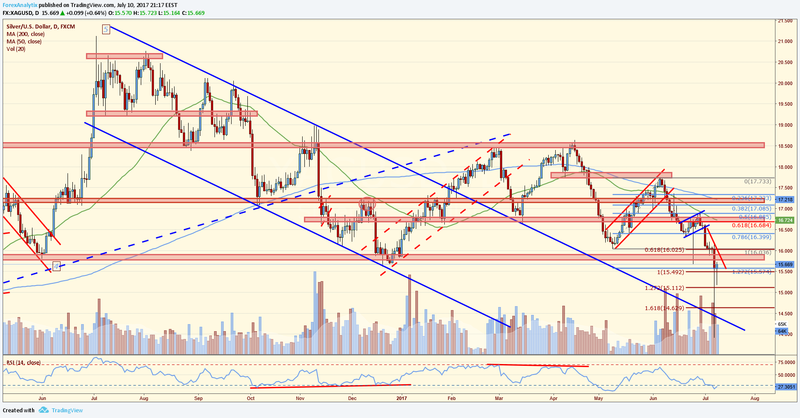 The sharp sell off in silver futures last week reached the 0.886 Fibonacci retrace level from the 2016 lows. The 0.886 Fibonacci retrace and 1.13 Fibonacci extension are really good harmonic pattern levels. This sets up a text book ABC rally to the 0.236 Fibonacci level at 22.15. Confirmation that this pattern is setting up will be trading above 15.892 and then the 200 day moving average.